This is another image from our whirlwind tour of San Francisco. It was one of my first opportunities to really do some playing with my new Canon 15mm fisheye lens and the tiny tripod.It’s exactly this type of image that I’ve been experimenting with. While this is far from my best work, it’s an interesting perspective. The position of the camera and the exaggeration of perspective cause the tiny flower to seem much larger than life. Another thing that I’m really liking about this lens is the quality of the [wikipop]bokeh[/wikipop]. Bokeh describes the way that out of focus items, in this case, background items, appear. To add the correct scale the tall stalk, in the middle of the frame, is about 7″ tall. My lens is about an inch from the ground and is actually responsible for the shadow on the lower edge. It was a challenge keeping the tripod, and my fingers, out of the frame. To get this I had to crouch on the ground and use my angled viewfinder to compose the frame. My son took a very unflattering photo of me in “shooting position” with his cellphone. I don’t think that I’ll post that. There’s nothing special about the exposure on this. The shutter speed was 1/4000th of a second at f/2.8 and ISO 100. The light, while fairly bright but being scattered by a thin layer of clouds. The clouds did a really nice job of softening the shadows. 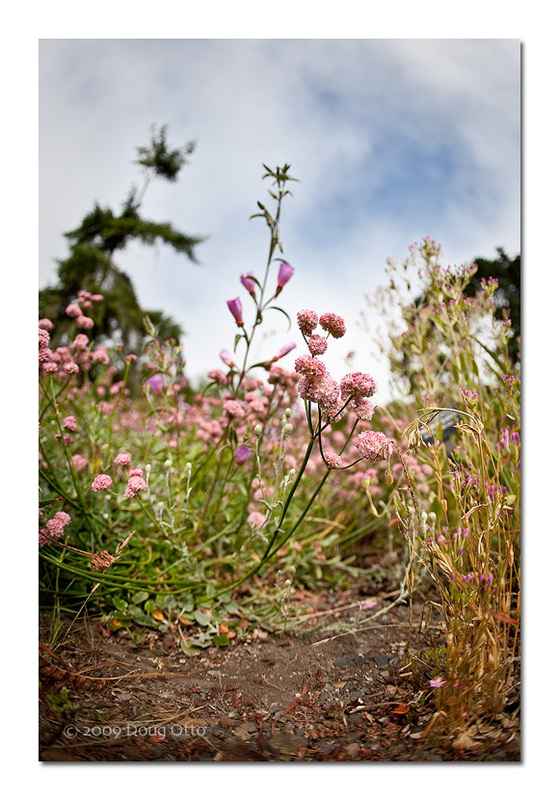 This entry was posted in Photography, Travel and tagged Canon 15mm fisheye, Canon 5D, closeup, doug otto, flower, Golden Gate Park, low perspective, San Francisco. Bookmark the permalink.